I've been dreaming of writing this guide for awhile–– many have requested it, but I never knew where to start. Although I was born and raised here, I find it overwhelming to comprise a list of recommendable places for people to enjoy because everyone's tastes are different. I also wanted to do my city justice! Savannah is the perfect place to visit on a long weekend–– you only really need 72 hours to soak in all of its beauty. I would recommend visiting in the spring when all of the Azaleas are in bloom (late March/April) or in the fall (Octoberish) since it gets extremely humid and hot in the summer. Surprisingly, the winters here can get pretty cold, especially in January and February. This Kessler boutique hotel is super elegant and it's located on the gorgeous Forsyth Park. It's in a Victorian style mansion, and it's worth the price. The Andaz is in a spectacular location and it appears to be super trendy. It is run by Hyatt, and it has a cute little pool! I've heard nothing but amazing things about it. Super cute, and the hotel has an adorable Italian restaurant and bar inside. This hotel is almost brand new and it is located on Bay Street. It has the best rooftop bar in town (which I'll talk about later). Also on Bay street, right next to Cotton Sail. Superb decor, and a lovely restaurant on the river. They also have a great rooftop bar! This place has made it on the Food Channel and won awards for its sandwich, "the Conquistador." Their South African food is unique yet tasty, and there's no wonder that there is always a line. Dirt cheap pizza and beer, but it's the best pizzeria in town by far. Great people watching since it's in City Market. They also have a killer greek salad. This is a favorite of the locals–– it's an upscale dive with amazing drinks, great water views, and if you have a boat, you can dock there (hence the name). We eat here at least once a week! Try the crispy fish and grits, the hummus, the okra, and their berry cobbler (you honestly cannot go wrong with any of their menu items though). It's a little out of the way, but definitely worth the Uber drive. A great place downtown to grab a sandwich or salad. They have plenty of gluten free and vegan options as well. This is the best place for brunch–– their french toast and mimosas are phenomenal, and if you still have any mimosa left at the end of the meal (which I doubt you will), they will give you a plastic champagne flute to go (there are no open container laws in downtown Savannah). I tried this place quite recently with some friends after hearing rave reviews, and it did not dissapoint. My panini was phenomenal! This is an amazing dinner spot. It feels so homey inside, and everything on the menu is to die for. They are famous for their seafood. Make reservations, because it gets booked up fast. Great contemporary American food with a fun atmosphere, and a good bar as well. Get their tomato bisque and grilled cheese–– it's unreal. Such a cute lunch spot (they aren't always open for dinner). The NYC vibes and the industrial garage doors give this place such a cool feeling, and the bar area feels like it's out of a movie. This restaurant sits inside of a renovated Greyhound bus depot (hence the name). It's super sleek, and the contemporary southern dishes are so yummy! The only place in Savannah where you can grab an authentic liege Belgian waffle–– dare I say more? This is the most popular ice cream parlor in the state, and it has earned it. Their rich, creamy ice cream is worth the long lines. Service is friendly, and the inside is worth seeing–– it was opened by Stratton Leopold, a film producer, so there's a lot of cool movie memorabilia inside. This place is perfect for dessert lovers. They have amazing fondue and creme brûlée, and they also have alcoholic chocolate drinks. This is a little drive away from downtown Savannah, but it's where all of the locals go for their barbecue. The ribs are so good! The. Best. Mexican. Food. Seriously, their tableside guac is to die for, and their frozen margaritas are unreal. This chic store is located on Broughton Street and it has neat finds from all over the world. They also sell pastries, macarons, and delicious coffee. They have cute, Parisian style outdoor tables, and the window displays are always so grand. It's the perfect place to cool off on a summer day. Super cute home decor, soaps, and candles among other things. Located on Jones Street. Located on Bull Street–– features lovely artwork for sale from the brilliant students of the Savannah College of Art and Design. They have unique clothing, jewelry, and paintings. Offers brands like Amanda Uprichard, Britt Ryan, and AG Jeans. Offers menswear brands such as Filson, Southern Proper, Peter Millar, and Barbour. This boutique chain was started in Dallas. They offer cute yet affordable dresses, rompers, and accessories. All bigger retailers, yet it's fun to browse their selection of clothing. New clothing stores are popping up quickly on Broughton as part of a restoration and expansion project. A chain makeup store, yet the staff is so helpful and knowledgeable so it's worth noting. Definitely worth popping in. The drinks are great, and they have the absolute best sunset views in the city! It's a must. This is another rooftop hotel bar, right next to Top Deck–– ideal for bar hopping back and forth. This place has the most insane drinks–– Rice Krispie martinis, birthday cake martinis, and bananas foster martinis. It's so fun to walk through and see the new exhibits every academic quarter. The museum itself is beautiful, and the contemporary art is so interesting. In the past, they have had Oscar de la Renta gowns on display (such a cool exhibit). Another contemporary art museum–– they have had Warhol exhibits and original Elvis photos in the past. It's also a great place to bring kids. I actually love walking my dog here–– it's so cool to see a Civil War era fort, and they have kept it up so nicely. Makes for cool photos, especially if you walk around inside. This is the iconic Savannah tree lined driveway. It's most definitely overpriced, but worth it for the glorious photos–– a ton of people take wedding shots here. This is where I take a majority of my blog photos–– the trees are insanely beautiful, the fountain is magic, and in the spring, the azaleas are in full bloom. You have to go! Jones street has the cutest shops and houses. It's super picturesque, and it's another spot I find myself taking blog photos at regularly. Many people go to Savannah for the Saint Patrick's day parade–– we have the second largest in the country, and half a million people come into town for it. It can be fun, but if you don't want to hang out with sweaty, drunk people all day, avoid visiting Savannah the week before, during, and after the holiday. Avoid Paula Deen's restaurant. It's a total tourist trap, and the food is horrible. Don't pay $25 for a plate of subpar fried chicken. Just don't. If you want good fried chicken, go to Ms. Wilke's. River Street is fun to walk on, but it's also super touristy. Some of the restaurants are decent, but others are garbage. It's the Times Square of Savannah–– loved by tourists, hated by locals. People (especially northerners) underestimate the sheer humidity and heat of a Georgia summer. Be prepared, it's miserable. Do not do carriage tours in downtown Savannah. The companies make the horses pull people in 110 degree heat, which I find extremely disturbing. The best way to see the city is on foot. That's all I have for now, but I will update this guide periodically with new restaurants and shops! I hope this guide helps y'all! You definitely hit my faves: Wyld & Kayak...yum! Tequila's is another fave, too. And I adore Paris Market! Yes! I love Tequila's! How could I forget? adding it to the list now. 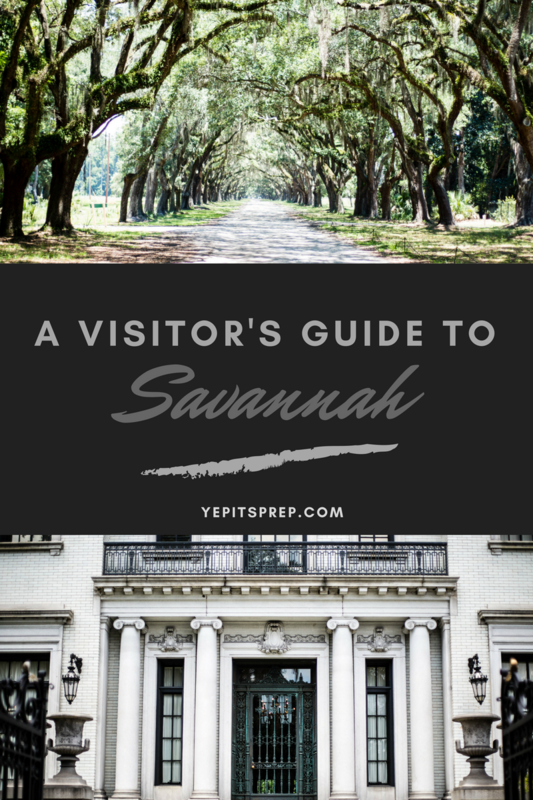 I have been dying to go to Savannah for years now but haven't made it yet. This post definitely has me wanting to plan a trip ASAP! Savannah is so amazing and there is so much to do! I haven't been in years and years but I have to get down there again, soon! I'd love to go there one day! Great post!